Turnbull should put more money into ovarian cancer detection. Before this year is out 1500 Australian women will have been diagnosed with ovarian cancer. Within five years, more than half of them will have succumbed to this insidious disease for which there is no screening test, no method of prevention, and is very hard to detect. It’s a silent killer and women diagnosed with this disease need all the help they can get. Sadly, this year, the Turnbull Government is doing the exact opposite with December’s budget update cutting $650 million from spending on the tests and scans which are vital to detecting, treating, and fighting diseases like ovarian cancer. Figures prepared by the Australian Diagnostic Imaging Association shows on a best case scenario for ovarian cancer based on catching the cancer and the first treatment being successful these women now face upfront costs of between $3,472 and $4,429. Even after the Medicare rebate, they are left between $365 and $1,322 out of pocket. Source: Australian Diagnostic Imaging Association – the peak body for all DI clinics. And, as you might expect, this is not confined to ovarian cancer. For women with suspected breast cancer, the ADIA estimates a previously bulk-billed patient referred for diagnostic mammography, an ultrasound and possibly an ultrasound-guided core biopsy will be left with upfront costs of between $282 and $554 and out of pocket costs of $29 to $302 even after receiving all the Medicare rebates. I have no doubt that many women, when they hear these examples and when they see what these cuts actually mean for what patients, potentially, will pay in out-of-pocket costs, will be extremely distressed by that—and they should be, especially when it comes to a disease as hard to detect as ovarian cancer. For many, many women, the symptoms do not show until it is too late. They are symptoms that we all generally put down to being of our gender. We might be a bit tired, we might be feeling a bit bloated or we might have to wee a bit more, but we do not necessarily think that these are things that we should absolutely, desperately, go and see the doctor about. 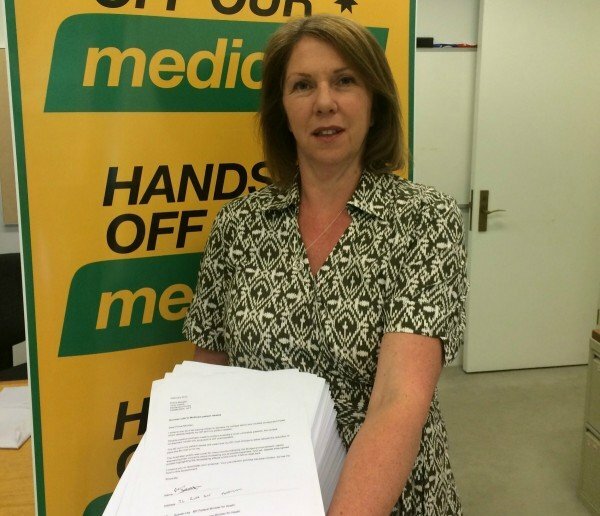 Catherine King holding the healthcare petition: Image provided. That is why it is so crucial that we do more to raise awareness—for women and for the men and partners who love them—so that we can save more women from this disease. For me – as is the case with too many women – this is a very personal journey. I lost a very good friend and a very good mentor, Betty Leahy. Bet was an extraordinary and gorgeous woman who provided financial counselling services at Child and Family Services before she retired, and who mentored me as a young social worker and friend when I worked there. Shortly before she died, Bet asked me come and see her in St John of God Ballarat Hospital. 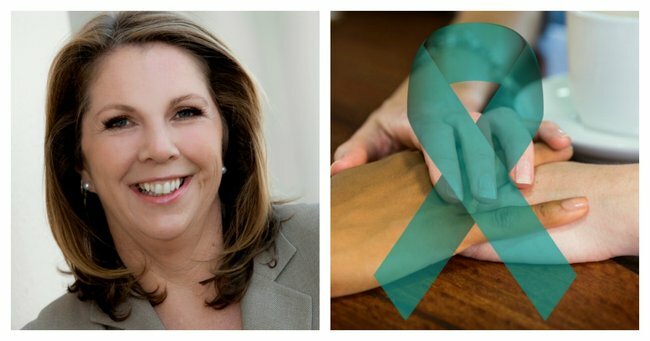 She particularly asked me to use my position as Labor’s health spokesperson everywhere I go, to talk about ovarian cancer, to champion the cause, and especially to focus energy and efforts on getting more research into diagnosis, prevention and treatment. So Bet, I hope I am slowly honouring your memory by doing what I can to elevate this cause and by standing up against these Budget cuts to pathology and diagnostic imaging, because the last thing women told they may have ovarian cancer need is to have that fight made harder, and more expensive by a government. Catherine King MP is the Shadow Minister for Health and the Federal Member for Ballarat. You can follow her on Twitter here.